So, which KPIs should you measure? 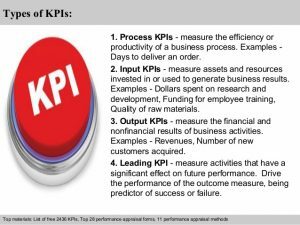 In this blog, I’ll be looking at some Key Performance Indicators – or KPIs – you could measure. They won’t all be relevant to your business, but there‘ll be some that will work for you and your business. Before you start the process of identifying and measuring your KPIs, you need to translate your business objectives into measureable goals. I often refer business owners to an article by ‘Optimize Smart’ – that’s Optimize with a ‘z’. If you’re interested in reading it please search online for ‘Optimize Smart translate business objectives’. What is it that you want to achieve within your business? Improved efficiency of your workforce? Quicker handling of customer complaints? Whatever it is, there is a KPI that you can set, to help you track your performance and help achieve your objectives. These will help you identify when your business or organisation is underperforming and when it’s doing well. For example, the value of sales resulting from an advert. You‘ll be able to decide whether this marketing activity is worth repeating. It’s important for every business owner to maximise the number of chargeable or profitable hours. KPIs are targets for you to use in growing your business. These are targets to beat and can help you to motivate and reward staff. If you’d like help in setting up your KPIs, or management reporting, then please get in touch.